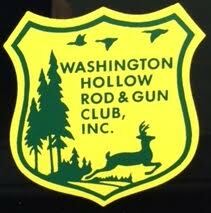 The Washington Hollow Rod and Gun club was formed and incorporated in 1939. The club was originated by 9 residents of the village of Millbrook. Some of which owned their own Construction businesses. In the beginning, the club met homes of members and later at a local Restaurant/tavern in the village of Millbrook called the Grape Shade. In 1946, the Club purchased 23 acres of land on the corner Tinkertown and Davis Road, just off the Parkway at Washington Hollow, New York. In 1947, they began construction of and completed a 24 X 30 ft. club house, using surplus lumber collected from large construction jobs of the originating members. The Club house was made up of a Main meeting room, a kitchen, and bathroom facilities. The building is heated by force hot air. In the Past year, with additional work performed, the inside of the Club was paneled a new lighting installed. Meeting are held the second Tuesday of each month, with occasional Special meetings The Club has facilities for a Shooting Range, both Handgun, Shotgun and Rifle, and is contemplating a Trap Range. See today’s current board members.